This Blog is Systematic. : Risk targeting and dynamic asset allocation: absolute or relative momentum? great article as always. And I fully bought your risk weighting methodology and actually manage my own portfolio like that. I was just wondering. Do you think the whole momentum weighting is actually worth it? like on a real world implementation stand-point? ok, sharpe is around 0.1 worse but this is a backtest.. and keeping track of all the 12m performance and weighting it makes the handling slightly complicated. You think I leave returns on the table for not implementing it? I find this question fascinating :-) Let me answer it first and then explain why it's such an interesting question. Let's say the out performance is just 0.2% a year - much less than the figures show but better to be pessimistic. If your portfolio was $100K then you'd earn an extra $200 a year, or $16 a month. With spreadsheets and automatic data feeds it is probably going to take you about half an hour a month to do this. So if your hourly pay is more than $32 it probably isn't worth doing this. This simple analysis ignores compounding effects. That all suggests that only people with quite large portfolios and quite low hourly pay should bother. Basically retired people. In a real world situation, once costs are accounted for, then you still get most of the benefit from rebalancing annually. The breakeven with a $100K portfolio will go up to $400 an hour. That is a wider set of people! Why is this question interesting? Because it gives us an interesting angle on the whole efficient market hypothesis. Arguably the market is efficient if 'Smart Beta', such as momentum, is only available to those who are willing to put the time into capturing it. We can view 'Smart Beta' as a reward for time spent capturing it. For retail investors that reward is too small to make it worth their while. But if you have a large institutional portfolio then amortising the cost of a couple of guys with a spreadsheet and a Bloomberg terminal over hundreds of millions of pounds makes it all worthwhile. The effect of rebalancing weights for historical volatility. From your book, it seems like you don't think it matters much if you use the historical estimates of standard deviation for each asset class, or use a 12 month trailing volatility estimate (either with or without exponential MA). Since the first option (constant volatility estimate) means you ignore changes in volatility when rebalancing, there should be a difference between them. What about giving recent volatility even more weight, like using a 60 day trailing volatility? I would expect that shortening the historical volatility window will result in lowering the overall volatility of the portfolio. It is also not clear to me why you conclude that relative momentum is the better choice. I understand why it is superior when looking at geometric mean, but risk wise? How do they compare when looking at draw-downs during fat-tail events? What about the possibility that future returns of either asset class will exhibit longer periods of negative returns? wouldn't that make absolute momentum a winner in risk adjusted returns? I have a relatively large portfolio, with a moderate risk tolerance. I chose to go with the compromise risk weights you suggested in your book - 30% risk weight for bonds (I don't fill comfortable allocating higher risk weight to bonds). I'm leaning towards using the relative momentum model, but would like to have some of that 'down-side' protection that the absolute momentum model offers. It seems like combining relative momentum with a shorter historical volatility window might do the trick. Does that make sense to you? If so, I need to know how much weight I'm already giving recent volatility just by using the momentum model. Thanks a lot for all the valuable and practical knowledge in your books + the great tools (pysystemtrade & spread sheets). I will do a multipart answer here. "What about giving recent volatility even more weight, like using a 60 day trailing volatility? I would expect that shortening the historical volatility window will result in lowering the overall volatility of the portfolio." The sweet spot for predicting future volatility is something like a 30 to 60 day window. However predicting future volatility better doesn't necessarily improve returns, and it certainly wouldn't reduce realised volatility. In my fully automated system I use something like a 30 day lookback, but in a slower manual system the gains from doing this are minimal vs the extra work involved. "Using a momentum model for adjusting weights (either relative or absolute) means recent volatility does effect your weights, but by how much? How would the fixed weight option from this post compete against momentum if you would have shortened the volatility window from 12 months to 60 days? (maybe with a 'no trade zone' to reduce costs)"
As I already said reducing the vol lookback would hardly make any difference to performance. "It is also not clear to me why you conclude that relative momentum is the better choice. I understand why it is superior when looking at geometric mean, but risk wise?" As I said in the post absolute momentum always has lower risk than relative momentum for a given strategic risk allocation. So to compare them fairly we need to jointly look at both risk allocation and choice of filter. Once that is done relative momentum generally wins. 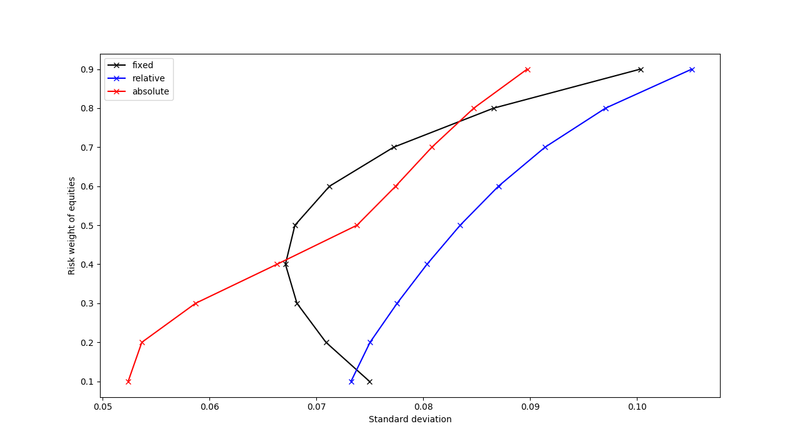 "How do they compare when looking at draw-downs during fat-tail events? " I haven't looked at this. 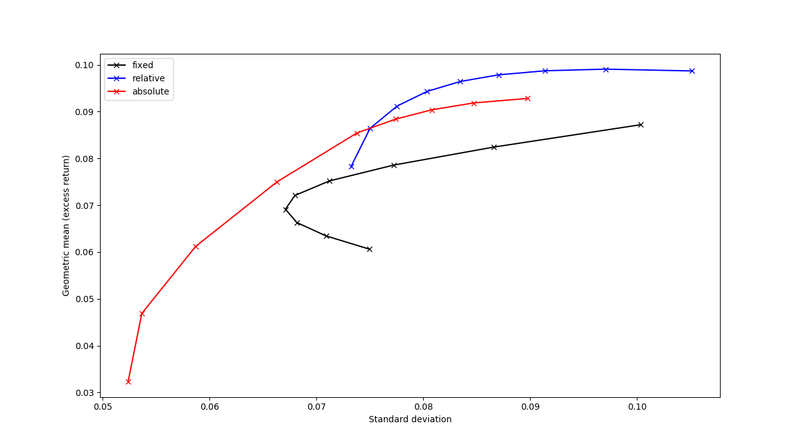 I'm not super keen on using draw down as a risk measure, since there is a lot more parameter uncertainty. Clearly in a tail event where both equities and bonds fell then absolute momentum would do better. In a tail event where one went up and one went down (2008) relative momentum would do better. Depending on how you define 'tail event' there may only have been a few events in each category so we are unlikely to get results that are statistically significant. "What about the possibility that future returns of either asset class will exhibit longer periods of negative returns? wouldn't that make absolute momentum a winner in risk adjusted returns?" Obviously it would. For that to happen however the future would have to be significantly different from a very long period of the past (1954 to 2006). As someone who builds trading models based on backtests I always assume that I can't predict the future, but that the future will be sufficiently like the past that a simple trading model will continue to perform as it did historically. "I have a relatively large portfolio, with a moderate risk tolerance. 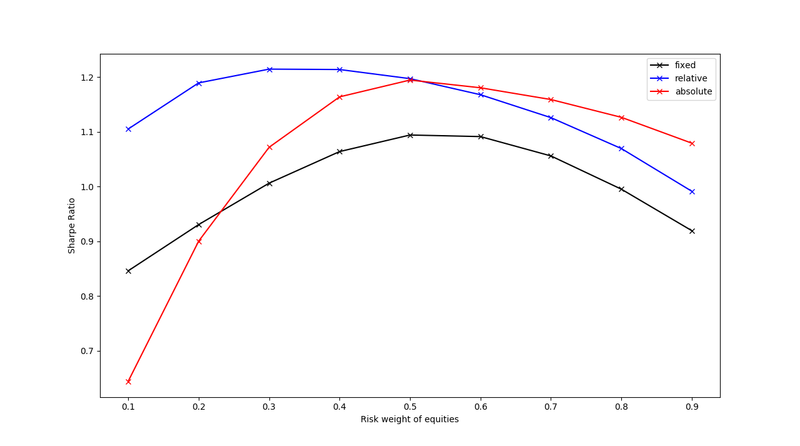 I chose to go with the compromise risk weights you suggested in your book - 30% risk weight for bonds (I don't fill comfortable allocating higher risk weight to bonds). I'm leaning towards using the relative momentum model, but would like to have some of that 'down-side' protection that the absolute momentum model offers. It seems like combining relative momentum with a shorter historical volatility window might do the trick. Does that make sense to you? " Using a shorter historical window is fine if you are happy with the extra work involved, but like I said it won't reduce your volatility or improve your returns, just give you more accurate risk targeting. - your risk will be reduced, so you may want to increase your strategic weight to equities. Generally speaking it's going to be harder to get your risk right with absolute momentum as there is more uncertainty about what it will be (ironic if you're going to reduce your volatility lookback, since the only benefit of that is to get better risk targeting). "If so, I need to know how much weight I'm already giving recent volatility just by using the momentum model." I don't really understand this statement. Using the momentum model doesn't 'give more weight to recent volatility'. It just changes your strategic weights. Thanks for clearing the whole volatility issue to me. I just ran a few simple tests, and the difference between shorter and longer volatility windows is indeed very small. If I may, one more question: Is there a difference between relative and absolute momentum for someone who pays a higher tax rate for short term profits (US)? "Is there a difference between relative and absolute momentum for someone who pays a higher tax rate for short term profits (US)?" I wouldn't have thought so. Generally momentum is probably more tax efficient than fixed weights, but I am not sure the different forms of momentum would be very different. "I don't really understand this statement. Using the momentum model doesn't 'give more weight to recent volatility'. It just changes your strategic weights." The question was about 'punishing' volatility a bit more. For example, what effect would using a 1.25 F factor for the momentum model will have on the results? would it be the same as just allocating more risk to bonds in the first place? "Generally momentum is probably more tax efficient than fixed weights"
I'm assuming this is because of the 'trend following' effect: letting your winners run longer and cutting your losses faster. "The question was about 'punishing' volatility a bit more. For example, what effect would using a 1.25 F factor for the momentum model will have on the results? would it be the same as just allocating more risk to bonds in the first place?" "Generally momentum is probably more tax efficient than fixed weights" I'm assuming this is because of the 'trend following' effect: letting your winners run longer and cutting your losses faster." "Sorry I don't understand what 'using a 1.25F factor' means. Nor do I understand what you mean by 'punishing volatility'..."
It just means that when you calculate your assets' sharpe ratio, you multiply the standard deviation with a constant which is larger than 1. "It just means that when you calculate your assets' sharpe ratio, you multiply the standard deviation with a constant which is larger than 1." Ok, frankly that's weird. I can't think of any reason why that would make sense. thanks for the answer. fully agree. probably I'm just lazy and somewhat sceptical to buy more of the things which went up more so the fixed weighting is appealing to me. I'm afraid I don't have time to do any consulting right now, and to be honest I do charge quite high fees when I do! A question regarding the choice of 12 month returns as a parameter for the momentum model. Do you think averaging a couple (or more) return periods would decrease parameter sensitivity? Kind of what you do in your trend-following model with the different variations for each trading rule. Yes this is a good thing to but more work. So up to you. You could use an average of 3...18 month averages. I probably wouldn't go shorter or longer, or mean reversion will kick in. In order to average multiple return/std periods, do I need to annualize both the total returns and the STD for each time period?